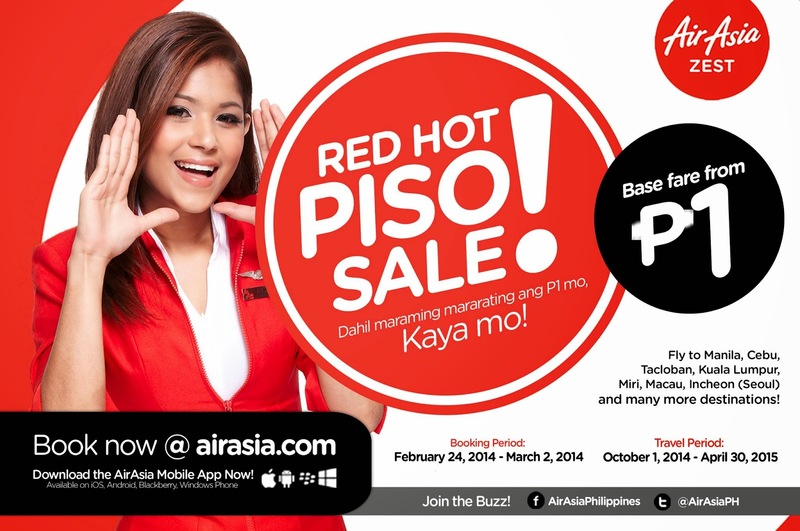 Piso Fare 2019 Promos Until 2020: Piso Fare 2014-2015 From Air Asia Zest Ongoing! Piso Fare 2014-2015 From Air Asia Zest Ongoing! Piso Fare: Woo-hoo! Our #REDHotPiso Sale is here and it’s time to book your getaways for this year until 2015! Dahil with AirAsia Zest, maraming mararating ang Piso mo! Fly to/from Manila, Cebu, Davao, Boracay (Kalibo), Puerto Princesa, Bohol (Tagbilaran) and Tacloban from as low as P538 and to/from Manila, Miri, Macau, Shanghai, Seoul, Kota Kinabalu & Kuala Lumpur from as low as P461 – everything’s all-in! Book now for huge savings! ‘Share’ this with your family and friends and let your P1 fly you to places. Pls. call Air Asia Zest's Number at 742-2742 for any information. Piso Fare of Php 28 only! Piso Fare 2014 to 2015 from Air Asia Zest! Valentine Dinner at The HUB! P99 Piso Fare Promo From Manila and Cebu! Php 788 Piso Fare As Cheapest You can Get! Piso Fare Backpacker Challenge 2014!